Leopold M. Loeb was born in Hamburg, Germany in 1849. He immigrated to New York in 1866, and became a naturalized citizen in 1877. Loeb made his living as a music teacher in Toledo, Ohio, before moving his family to Los Angeles in the 1880’s. The first record of Leopold M. Loeb’s residence in Los Angeles is in the City Directory of 1887, which lists him as a music teacher. 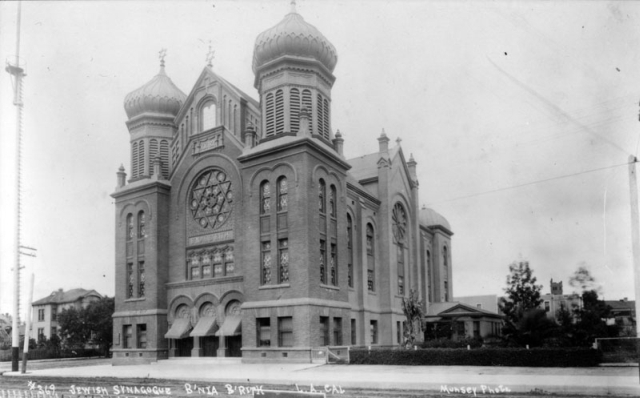 Shortly after his arrival in Los Angeles, Loeb was hired as organist of Congregation B’nai B’rith, then under the leadership of Rabbi Emanuel Schreiber, the second rabbi of Los Angeles’ original synagogue. Rabbi Schreiber introduced a number of reforms to the congregation, which caused a rift between an “Orthodox” core and more liberal members. Loeb was put in charge of a hired Gentile choir, which sang repertoire in line with American Reform temples of that time. Rabbi Schreiber left B’nai B’rith in 1889. His replacement was Rabbi Abraham Blum, a French-born rabbi late of Galveston, Texas. Rabbi Blum brought further “reforms” to the congregation, including the introduction of a cornet in place of the shofar. Several of the “Orthodox” members left, placing financial strains on a congregation already reeling from an economic depression in the city. Lack of funds forced the dismissal of Loeb and the choir in 1893. 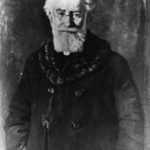 Loeb returned as organist and choirmaster in 1894, evidently with the encouragement of Rabbi Blum. However, he resigned in protest the following year, and also gave up teaching music. He became proprietor of the Pacific Installment Company. In 1894 the temple board decided that Rabbi Blum should leave “gracefully” after the High Holidays. When the time came, he refused and was acrimoniously let go in 1895. Precisely why his job was terminated is not clear. The board was apparently upset that he had applied to be a French teacher at a Los Angeles high school. Others complained that his worldly manner was not befitting a Rabbi. Leopold M. Loeb and Rabbi Blum made newspaper headlines in 1895. Tensions between the men ran high, with Loeb blaming Rabbi Blum for ending his career at Congregation B’nai B’rith. The situation led the men to fisticuffs on a city sidewalk. In 1878, Leopold M. Loeb married Emma Redelia Tripp and settled in Toledo, Ohio. Their daughter, Matilda, was born in 1879. Leopold Loeb passed away, in 1911, at the age of 62. He was laid to rest at Angelus Rosedale Cemetery in Los Angeles. Jonathan L. Friedmann, A City Haphazard: Jewish Musicians in Los Angeles, 1887-1927 (Washington, D.C.: Academica, 2017).